Not only are trash cans unsightly, but they take up valuable floor space too. Tucking away the trash cans in pull out drawers keeps the kitchen looking clean and the walk ways free for foot traffic. Pull-out garbage and recycling bins are the future when it comes to space management with the added benefit of a cleaner looking space. Often a dead space in most kitchens, the cabinetry directly in front of your sink can actually be functional. Called “sink tip-out trays,” these little storage units are genius ideas to keep cleaning utensils out-of-site but close by for easy access. They don’t offer a ton of storage, but when a little goes a long way in smaller kitchens, we’ll take all we can get. The arch nemesis of organization, larger pans and pizza plates can spell nightmares for small kitchen storage, but vertical storage cabinets are the perfect solution. Storing pans sideways in easy-to-access alcoves, the solution to your space saving prayers are answered. They have the added benefit of keeping things organized too (because no one has time to wait for oven pizza). Often seen in utensil drawers, drawer organizers can save space and frustration by keeping everything in order – especially the silverware. Nothing spells wasted space like a drawer crammed full of disorganization. The awesome part? While you can purchase cabinetry designed with organization features, you can also find a lot of awesome drawer organizers in stores like the Container Store or Target making drawer organization the space-saving salvation. Space saving is all about the unexpected. Under-cabinet toe-kick drawers (try saying that 5 times fast) put secret storage where you least expect it – in a space most kitchens fail to maximize – under your cabinetry. Flat items like wrapping paper, large plates, and art project supplies would fit in these slim cabinets keeping things out-of-sight but still accessible when arty inspiration strikes. There’s no end to awesome kitchen storage ideas. 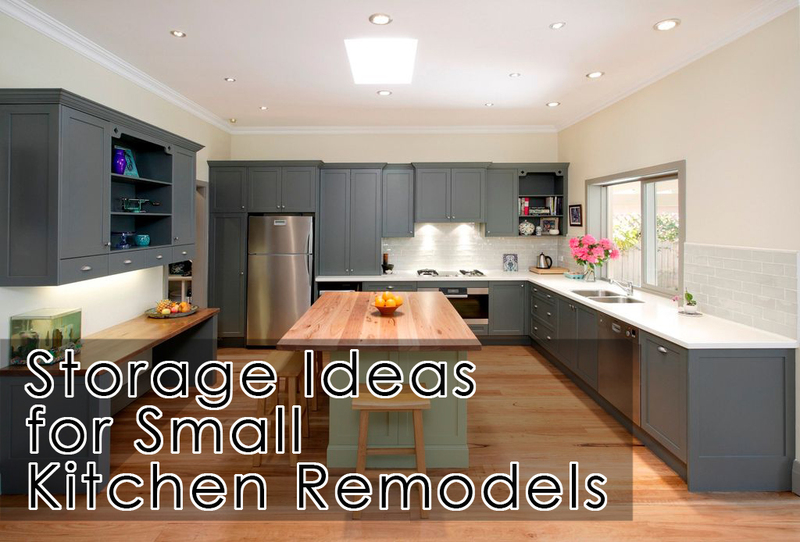 When it comes to Northern Virginia Kitchen Remodeling, stop by our showroom to find other great ideas when it comes to organization for small kitchen remodels.